Bank of England. &c. against Morice. 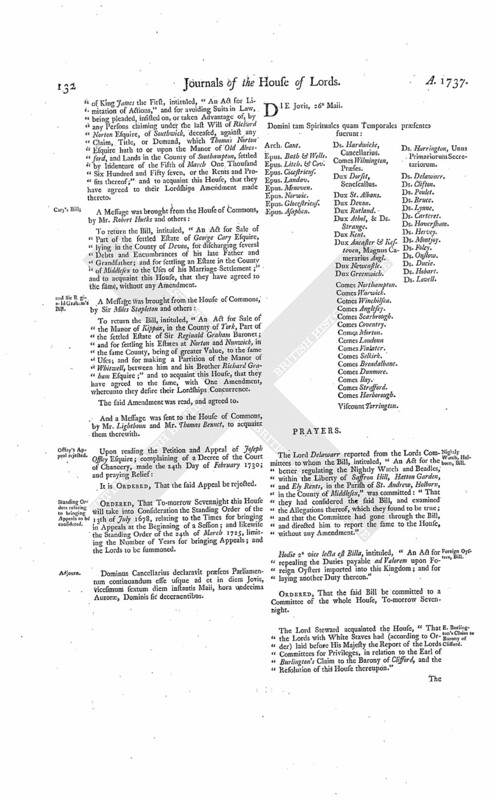 Counsel (according to Order) were called in, to be further heard, in the Cause wherein the Governor and Company of the Bank of England, James Henckell and others, Theodosia Crowley and Joseph Gascoigne Nightingale, and Benjamin Weale and others, are Appellants, and Katherine Morice and others Respondents. Ordered, That the further Hearing of this Cause be adjourned till Monday next. Earl of Burlington's Claim to the Barony of Clifford. Ordered, That the Sitting of the Committee for Privileges, to whom the Petition of the Earl of Burlington to His Majesty, claiming the Barony of Clifford, and the Attorney General's Report thereupon, is referred, be put off from Monday to Wednesday next. Dominus Cancellarius declaravit præsens Parliamentum continuandum esse usque ad et in diem Lunæ, vicesimum tertium diem instantis Maii, hora undecima Auroræ, Dominis sic decernentibus. 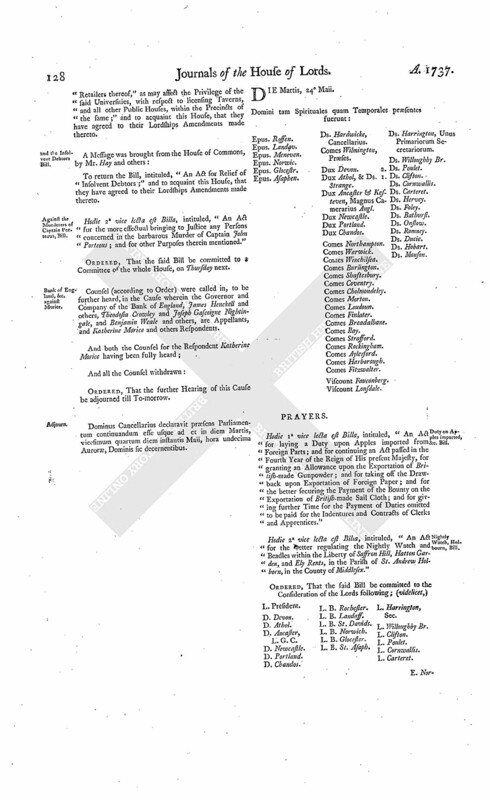 To return the Bill, intituled, "An Act for the more effectual preventing the unlawful playing of Interludes, within the Precincts of the Two Universities, in that Part of Great Britain called England, and the Places adjacent; and for explaining and amending so much of an Act passed in the last Session of Parliament, intituled, "An Act for laying a Duty upon the Retailers of Spirituous Liquors, and for licensing the Retailers thereof," as may affect the Privilege of the said Universities, with respect to licensing Taverns, and all other Public Houses, within the Precincts of the same;" and to acquaint this House, that they have agreed to their Lordships Amendments made thereto. and the Insolvent Debtors Bill. To return the Bill, intituled, "An Act for Relief of Insolvent Debtors;" and to acquaint this House, that they have agreed to their Lordships Amendments made thereto. Hodie 2a vice lecta est Billa, intituled, "An Act for the more effectual bringing to Justice any Persons concerned in the barbarous Murder of Captain John Porteous; and for other Purposes therein mentioned." Dominus Cancellarius declaravit præsens Parliamentum continuandum esse usque ad et in diem Martis, vicesimum quartum diem instantis Maii, hora undecima Auroræ, Dominis sic decernentibus. Duty on Apples imported, &c. Bill. Hodie 1a vice lecta est Billa, intituled, "An Act for laying a Duty upon Apples imported from Foreign Parts; and for continuing an Act passed in the Fourth Year of the Reign of His present Majesty, for granting an Allowance upon the Exportation of British-made Gunpowder; and for taking off the Drawback upon Exportation of Foreign Paper; and for the better securing the Payment of the Bounty on the Exportation of British-made Sail Cloth; and for giving further Time for the Payment of Duties omitted to be paid for the Indentures and Contracts of Clerks and Apprentices." Hodie 2a vice lecta est Billa, intituled, "An Act for the better regulating the Nightly Watch and Beadles within the Liberty of Saffron Hill, Hatton Garden, and Ely Rents, in the Parish of St. Andrew Holborn, in the County of Middlesex." Vis. Lonsdale. L. B. Rochester. Hodie 3a vice lecta est Billa, intituled, "An Act for the better regulating the Nightly Watch and Beadles, within the City of London and Liberties thereof; and for making more effectual the Laws now in being, for paving and cleansing the Streets and Sewers in and about the said City." Ordered, That the House be put into a Committee thereupon, on Thursday Sevennight. Ordered, That the House be put into a Commitee upon the said Bill on Thursday next. Ordered, That the Report of the Amendments made by the Committee of the whole House, to the Bill for regulating the Company of Watermen on the River Thames, be received on Thursday next. Bank of England, &c. against Morice & al. After hearing Counsel, as well on Wednesday, Thursday, Friday, Saturday, and Yesterday, as this Day, upon the Petition and Appeal of James Henckell, Mary Glover, and Henry Voght, William Snclgrave, James Pearce in his own Right and as Executor of Jeremiah Pearce deceased, Robert More and Mary his Wife Executrix of John Dagge deceased, and (fn. 1)Elizabeth Grove Administratrix of Joseph Grove deceased; complaining of a Decree of the Court of Chancery, of the 6th of November last, made in a Cause wherein Catherine Morice, Widow and Executrix of Humphry Morice Esquire, deceased, was Plaintiff, and the Appellants and others were Defendants; and praying, "That the same may be reversed; and that the Money now in the Bank may be paid out, to such of the Appellants respectively in respect of whose Debts it was brought into Court; and the Plaintiffs Bill, be dismissed, with Costs, as against the Appellants:" And likewise upon the Petition and Appeal of Theodosia Crowley Widow, and Joseph Gascoigne Nightingale Esquire; complaining of the aforementioned Decree; and praying, "That the same may be reversed; and that the Sum of One Thousand Five Hundred and Seven Pounds and Five Pence, paid by the Plaintiff into the Bank, may be paid to the Appellants; and that the Plaintiff's Bill may be dismissed, as against them, with Costs:" And likewise upon the Petition and Appeal of the Governor and Company of the Bank of England; complaining of the aforementioned Decree; and praying, "That the same may be reversed; and that the Appellants may be relieved, in such Manner as to the Wisdom of this House shall seem meet:" And likewise upon the Petition and Appeal of Benjamin Weale in his own Right, Lawrence Victorin and Francis Hayford, John Berdoe and Bearcroft Berdoe, Margaret Greaves Widow and Executrix of John Greaves deceased, Thomas Hardwell, Abraham Rutland, Sherman Godfrey, Joseph North, Benjamin Weale, and James Pearce, Executors of John Pearce deceased, Thomas White, Samuel Mascie and Susannah his Wife, which said Thomas White and Susannah Mascie are the Executors of Richard Blinks deceased, John Fell the Elder and John Fell the Younger, Executors of John Rice deceased; complaining of the aforementioned Decree; and praying, "That the same may be reversed; and that the Appellants may have such Relief as to the House shall appear just:" As also upon the several Answers put in to the said Appeals; and due Consideration had of what was offered on all Sides in this Cause: It is Ordered and Adjudged, by the Lords Spiritual and Temporal in Parliament assembled, That the said Decree complained of in the said Appeal be, and is hereby, affirmed, with this Variation; (videlicet,) That, in taking the Accompt of what is respectively due to the Respondents, who were Plaintiffs in the Cause wherein the Decree of the Court of Chancery, of the 25th Day of January 1731, was made, subsequent Interest, at the Rate of £. 5. per Cent. from the Time of filing the Bill, shall not be allowed; but that the Master of the said Court of Chancery, to whom the Accompt in this Cause stands referred, do inquire, and certify what Interest or Dividends the Assets of the said Humphry Morice, or any Part thereof, have produced since the filing of the said Bill in that Cause; and that, after the said Master shall have made his Report, the said Court do give proper Directions, for allowing, and paying to the said Respondents, the Plaintiffs in that Cause, such Proportion of the Interest and Dividends, as the Principal Demands of those Respondents remaining unsatisfied bear to the whole Fund of the Assets remaining in the Hands or Possession of the said Catherine Morice, or in the said Court of Chancery: And it is further Ordered, That this Direction shall not delay the Payment of the said Principal Demands, together with the Interest due for the same, before the filing of the Bill in the said Cause; but the said Respondents last mentioned are at Liberty to apply to the Court of Chancery, for Payment thereof, respectively, as that Court shall think just." Ordered, That the Cause wherein the Lord Howth is Appellant, and Eleazar Peirson Respondent, which stands for an Hearing To-morrow, be put off till Tomorrow Sevennight; and the other Causes on Causedays removed in Course. Dominus Cancellarius declaravit præsens Parliamentum continuandum esse usque ad et in diem Mercurii, vicesimum quintum diem instantis Maii, hora undecima Auroræ, Dominis sic decernentibus. E. Burlington a Right to the Barony of Clifford. The Lord Delawarr reported from the Lords Committees to whom it was referred to consider of the Petition of Richard Earl of Burlington, claiming a Right to the Barony of Clifford, presented to His Majesty, and by His Majesty referred to this House: "That the Committee had considered the said Petition; and heard Counsel, as well on Behalf of the Crown as the Petitioner; and examined Witnesses upon Oath, who fully made out the Petitioner's Pedigree, from Henry Lord Clifford, summoned to Parliament by Writ, dated the 17th Day of February 1627, in the Third Year of the Reign of King Charles the First (which Writ was produced before the Committee), directed Henrico Clifford Chevalier; and are of Opinion, That the Petitioner the said Earl of Burlington has fully proved the Allegations of the said Petition; and has made out his Right to the Barony of Clifford, created by the said Writ." Ordered, That the same be laid before His Majesty by the Lords with White Staves. Report on Mr. Godolphin's Petition about Roberts's Act. The Lord Bathurst reported from the Lords Committees appointed to consider the Petition of Mrs. Ellen Godolphin; complaining of an Imposition on the Legislature, in the procuring an Act of Parliament, for Sale of Part of the Estate of David Roberts Esquire, for Payment of Debts and Encumbrances; and of Neglects and Abuses of the Trustees, in the Execution of the Trusts reposed in them by the said Act; and praying Relief: "That the Committee have met, and considered the Matter to them referred; and have heard and examined several Persons in relation thereunto; and it appears to the Committee, That Richard Eadnell, One of the Trustees named in the said Act, was the principal Agent of the said David Roberts, in soliciting and procuring the passing of the said Act, and the chief acting Trustee under the same. 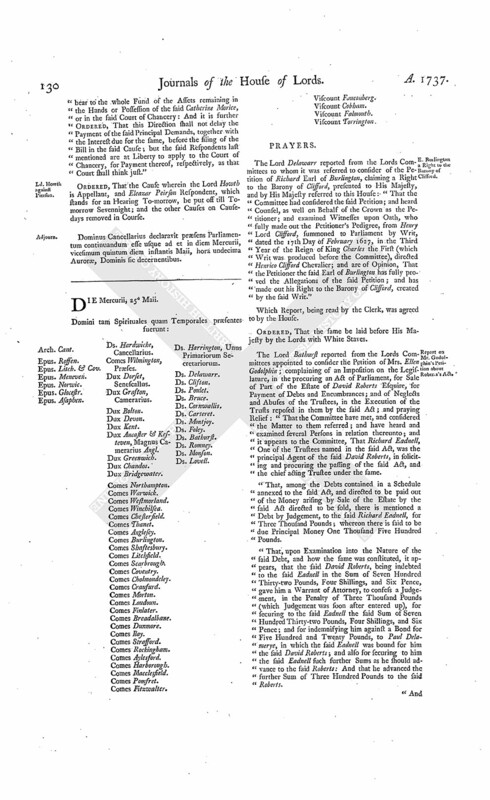 "That, among the Debts contained in a Schedule annexed to the said Act, and directed to be paid out of the Money arising by Sale of the Estate by the said Act directed to be sold, there is mentioned a Debt by Judgement, to the said Richard Eadnell, for Three Thousand Pounds; whereon there is said to be due Principal Money One Thousand Five Hundred Pounds. "That, upon Examination into the Nature of the said Debt, and how the same was constituted, it appears, that the said David Roberts, being indebted to the said Eadnell in the Sum of Seven Hundred Thirty-two Pounds, Four Shillings, and Six Pence, gave him a Warrant of Attorney, to confess a Judgement, in the Penalty of Three Thousand Pounds (which Judgement was soon after entered up), for securing to the said Eadnell the said Sum of Seven Hundred Thirty-two Pounds, Four Shillings, and Six Pence; and for indemnifying him against a Bond for Five Hundred and Twenty Pounds, to Paul Delamerye, in which the said Eadnell was bound for him the said David Roberts; and also for securing to him the said Eadnell such further Sums as he should advance to the said Roberts: And that he advanced the further Sum of Three Hundred Pounds to the said Roberts. "And here the Committee cannot but observe, that the said Eadnell caused the said Debt of Five Hundred and Twenty Pounds to Paul Delamerye to be inserted in the said Schedule as a further Debt; although it appears, from the Accompt which he gave of his own Debt, that the same was included in his Judgement for One Thousand Five Hundred Pounds; which the Committee apprehend to be a Fraud and Imposition in him the said Eadnell. "That it appears to the Committee, that Part of the Estate directed by the said Act to be sold was purchased by Mrs. Middleton, for Seven Thousand Nine Hundred and Fifty Pounds; but, in treating for the said Purchase, it was insisted by Mrs. Middleton's Counsel, that she should, out of the Purchase-money, pay off all such Encumbrances as were a real Charge and Lien upon the said Estate so to be purchased by her; and accordingly a Computation was made of all such Encumbrances, which amounted to Six Thousand Six Hundred and Twenty-three Pounds, Seven Shillings, and One Penny, and the same were accordingly paid off by her, out of the said Purchasemoney, by the Advice of her Counsel; and the Remainder of the said Purchase-money, being One Thousand Three Hundred Twenty-six Pounds, Twelve Shillings and Eleven Pence, was paid into the Hands of the said Eadnell. "That it also appears to the Committee, that, before the Sale of the said Estate, the said Eadnell borrowed of the Petitioner Mrs. Godolphin the Sum of Eight Hundred Pounds; and made an Assignment of his said Judgement to the Petitioner, as a Security for the Money so by her advanced: And though he received the Balance of the said Purchase-money, yet he has not discharged the said Debt due to the Petitioner; but has applied Part of the Money so received by him in Discharge of Debts not comprized in the said Act, and neglected paying the Debts thereby directed to be paid. "There is likewise contained in the said Schedule of Debts, referred to by the said Act, a Debt by Bond to Thomas Alexander, for Five Hundred and Seventytwo Pounds. "That it appears to the Committee, by a Bill of Parcels delivered in by the said Thomas Alexander, containing the Particulars of his Debt, amounting in the Whole to Seventy-eight Pounds Six Shillings; that there was, at the Time of passing the Act, no more really due to the said Alexander than the Sum of Fifty-two Pounds Twelve Shillings (Part of the said Debt, to the Amount of Twenty-five Pounds Fourteen Shillings, appearing by the Dates of the several Particulars to have been contracted after the Act passed). But it was alleged by the said Eadnell, That, at the Time of preparing the said Act, it appearing that Mr. Roberts was indebted to a great Number of Persons in small Sums, it was proposed, that the small Debts should be summed up together, and that Mr. Roberts should enter into a Bond to some substantial Creditor, who should stand as Trustee for himself and the other small Creditors; and accordingly Mr. Roberts entered into this Bond to the said Alexander. And here the Committee cannot but take Notice, that it does not appear that the said Alexander knew when the said Bond was so entered into by the said Roberts, or that he ever had the same in his Custody; nor was there ever any Declaration of Trust made for the Benefit of other Creditors, or any List made of the particular Creditors intended to be included in the said Bond. "That, after the passing of the said Act, Mr. Roberts applied to the Petitioner Mrs. Godolphin, to borrow Money of her; and proposed to get an Assignment of the said Bond made to her, as a Security; And thereupon the said Roberts promised the said Alexander, That, if he would join with him the said Roberts in an Assignment to the Petitioner, he should be paid his Debt of Seventy-eight Pounds Six Shillings; which the said Alexander, at the Request of the said Roberts and the Petitioner, and upon being paid his said Debt, consented to; and accordingly the said Bond was assigned over to the Petitioner, as a Security for the Sum of Four Hundred and Ten Pounds, which she had advanced to the said Roberts." Ordered, That the same be taken into Consideration To-morrow Sevennight. Apples imported, Duty on, &c. Bill. Hodie 2a vice lecta est Billa, intituled, "An Act for laying a Duty upon Apples imported from Foreign Parts; and for continuing an Act passed in the Fourth Year of the Reign of His present Majesty, for granting an Allowance upon the Exportation of British-made Gunpowder; and for taking off the Drawback upon Exportation of Foreign Paper; and for the better securing the Payment of the Bounty on the Exportation of British-made Sail Cloth; and for giving further Time for the Payment of Duties omitted to be paid for the Indentures and Contracts of Clerks and Apprentices." Walkinshaw's Appeal brought forward for hearing. 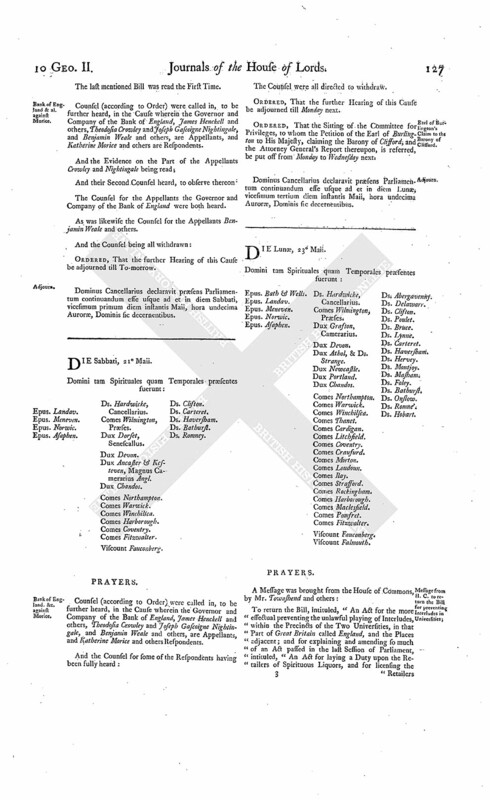 The House proceeded to take into Consideration the Petition of Mathew Crawfurd and James Corbet Merchants in Glasgow, and of His Majesty's Advocate for Scotland, presented the 16th Instant, and then ordered to lie on the Table; praying, "That a Bye-day may be appointed, for hearing the Appeal of John Walkinshaw, to which the Petitioners are Respondents." Ordered, That this House will hear the said Cause, by Counsel, at the Bar, on Tuesday Sevennight, being the 7th Day of June next; and that the Petitioners do forthwith give Notice thereof to the said Appellant. Duty on Sweets, lessening, &c. Bill. Hodie 2a vice lecta est Billa, intituled, "An Act for repealing the present Duty on Sweets, and for granting a less Duty thereupon; and for explaining and enforcing the Execution of an Act passed in the Ninth Year of His present Majesty's Reign, intituled, "An Act for laying a Duty upon the Retailers of Spirituous Liquors, and for licensing the Retailers thereof;" and for appropriating the Supplies granted in this Session of Parliament; and for making forth Duplicates of Exchequer Bills, Lottery Tickets, and Orders, lost, burnt, or otherwise destroyed." With a Bill, intituled, "An Act for repealing the Duties payable ad Valorem upon Foreign Oysters imported into this Kingdom, and for laying another Duty thereon;" to which they desire the Concurrence of this House. Messages from H. C. to return Norton's Bill. To return the Bill, intituled, "An Act to prevent the Act made in the Twenty-first Year of the Reign of King James the First, intituled, "An Act for Limitation of Actions," and for avoiding Suits in Law, being pleaded, insisted on, or taken Advantage of, by any Persons claiming under the last Will of Richard Norton Esquire, of Southwick, deceased, against any Claim, Title, or Demand, which Thomas Norton Esquire hath to or upon the Manor of Old Alresford, and Lands in the County of Southampton, settled by Indenture of the Fifth of March One Thousand Six Hundred and Fifty seven, or the Rents and Profits thereof;" and to acquaint this House, that they have agreed to their Lordships Amendment made thereto. To return the Bill, intituled, "An Act for Sale of Part of the settled Estate of George Cary Esquire, lying in the County of Devon, for discharging several Debts and Encumbrances of his late Father and Grandfather; and for settling an Estate in the County of Middlesex to the Uses of his Marriage Settlement;" and to acquaint this House, that they have agreed to the same, without any Amendment. and Sir Reginald Graham's Bill. To return the Bill, intituled, "An Act for Sale of the Manor of Kippax, in the County of York, Part of the settled Estate of Sir Reginald Graham Baronet; and for settling his Estates at Norton and Nunwick, in the same County, being of greater Value, to the same Uses; and for making a Partition of the Manor of Whitwell, between him and his Brother Richard Graham Esquire;" and to acquaint this House, that they have agreed to the same, with One Amendment, whereunto they desire their Lordships Concurrence. The said Amendment was read, and agreed to. And a Message was sent to the House of Commons, by Mr. Lightboun and Mr. Thomas Bennet, to acquaint them therewith. It is Ordered, That the said Appeal be rejected. Standing Orders relating to bringing Appeals to be considered. Ordered, That To-morrow Sevennight this House will take into Consideration the Standing Order of the 13th of July 1678, relating to the Times for bringing in Appeals at the Beginning of a Session; and likewise the Standing Order of the 24th of March 1725, limiting the Number of Years for bringing Appeals; and the Lords to be summoned. Dominus Cancellarius declarvit præsens Parliamentum continuandum esse usque ad et in diem Jovis, vicesimum sextum diem instantis Maii, hora undecima Auroræ, Dominis sic decernentibus. 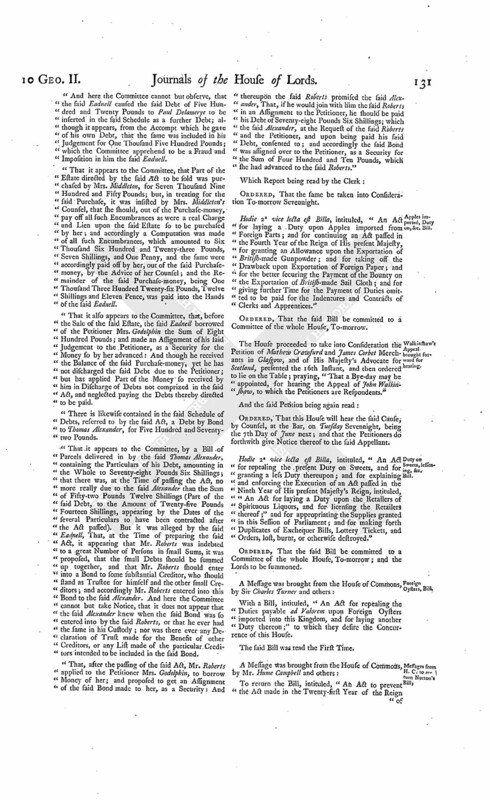 The Lord Delawarr reported from the Lords Committees to whom the Bill, intituled, "An Act for the better regulating the Nightly Watch and Beadles, within the Liberty of Saffron Hill, Hatton Garden, and Ely Rents, in the Parish of St. Andrew, Holborn, in the County of Middlesex," was committed: "That they had considered the said Bill, and examined the Allegations thereof, which they found to be true; and that the Committee had gone through the Bill, and directed him to report the same to the House, without any Amendment." Hodie 2a vice lecta est Billa, intituled, "An Act for repealing the Duties payable ad Valorem upon Foreign Oysters imported into this Kingdom; and for laying another Duty thereon." E. Burlington's Claim to Barony of Clifford. 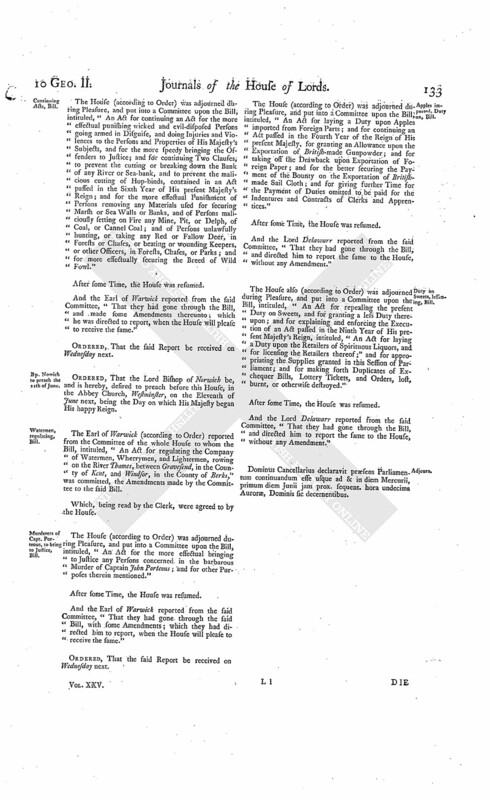 The Lord Steward acquainted the House, "That the Lords with White Staves had (according to Order) laid before His Majesty the Report of the Lords Committees for Privileges, in relation to the Earl of Burlington's Claim to the Barony of Clifford, and the Resolution of this House thereupon." The House (according to Order) was adjourned during Pleasure, and put into a Committee upon the Bill, intituled, "An Act for continuing an Act for the more effectual punishing wicked and evil-disposed Persons going armed in Disguise, and doing Injuries and Violences to the Persons and Properties of His Majesty's Subjects, and for the more speedy bringing the Offenders to Justice; and for continuing Two Clauses, to prevent the cutting or breaking down the Bank of any River or Sea-bank, and to prevent the malicious cutting of Hop-binds, contained in an Act passed in the Sixth Year of His present Majesty's Reign; and for the more effectual Punishment of Persons removing any Materials used for securing Marsh or Sea Walls or Banks, and of Persons maliciously setting on Fire any Mine, Pit, or Delph, of Coal, or Cannel Coal; and of Persons unlawfully hunting, or taking any Red or Fallow Deer, in Forests or Chases, or beating or wounding Keepers, or other Officers, in Forests, Chases, or Parks; and for more effectually securing the Breed of Wild Fowl." Bp. Nowich to preach the 11th of June. Ordered, That the Lord Bishop of Norwich be, and is hereby, desired to preach before this House, in the Abbey Church, Westminster, on the Eleventh of June next, being the Day on which His Majesty began His happy Reign. The Earl of Warwick (according to Order) reported from the Committee of the whole House to whom the Bill, intituled, "An Act for regulating the Company of Watermen, Wherrymen, and Lightermen, rowing on the River Thames, between Gravesend, in the County of Kent, and Windsor, in the County of Berks," was committed, the Amendments made by the Committee to the said Bill. The House (according to Order) was adjourned during Pleasure, and put into a Committee upon the Bill, intituled, "An Act for the more effectual bringing to Justice any Persons concerned in the barbarous Murder of Captain John Porteous; and for other Purposes therein mentioned." And the Earl of Warwick reported from the said Committee, "That they had gone through the said Bill, with some Amendments; which they had directed him to report, when the House will please to receive the same." Apples imported, Duty on, Bill. The House (according to Order) was adjourned during Pleasure, and put into a Committee upon the Bill, intituled, "An Act for laying a Duty upon Apples imported from Foreign Parts; and for continuing an Act passed in the Fourth Year of the Reign of His present Majesty, for granting an Allowance upon the Exportation of British-made Gunpowder; and for taking off the Drawback upon Exportation of Foreign Paper; and for the better securing the Payment of the Bounty on the Exportation of Britishmade Sail Cloth; and for giving further Time for the Payment of Duties omitted to be paid for the Indentures and Contracts of Clerks and Apprentices." Duty on Sweets, lessening, Bill. 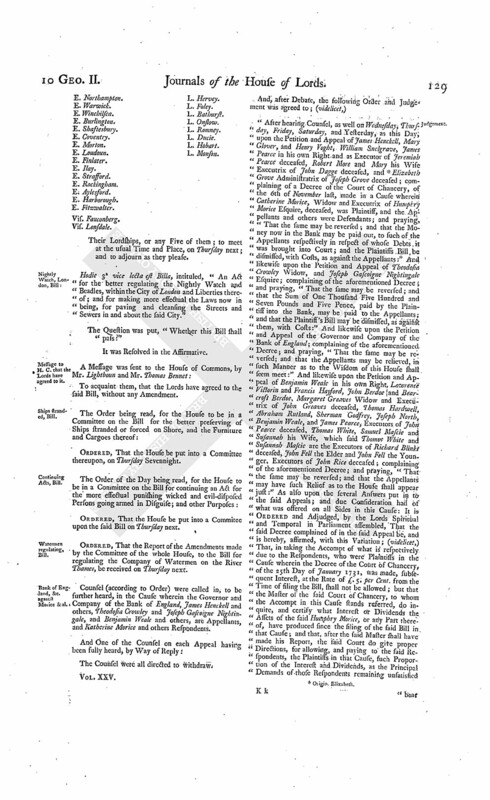 The House also (according to Order) was adjourned during Pleasure, and put into a Committee upon the Bill, intituled, "An Act for repealing the present Duty on Sweets, and for granting a less Duty thereupon; and for explaining and enforcing the Execution of an Act passed in the Ninth Year of His present Majesty's Reign, intituled, "An Act for laying a Duty upon the Retailers of Spirituous Liquors, and for licensing the Retailers thereof;" and for appropriating the Supplies granted in this Session of Parliament; and for making forth Duplicates of Exchequer Bills, Lottery Tickets, and Orders, lost, burnt, or otherwise destroyed." Dominus Cancellarius declaravit præsens Parliamentum continuandum esse usque ad & in diem Mercurii, primum diem Junii jam prox. sequent. hora undecima Auroræ, Dominis sic decernentibus.